joanofdark.com: Um, Mom? Something you wanna tell me? Um, Mom? Something you wanna tell me? 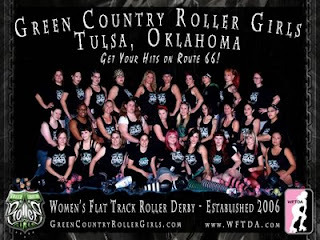 Green Country Rollergirls either has my twin in their league or my doppelganger. Either way, she and I need to meet, and see if the world splits in two. Or we unlock our wonder twin powers. Either way, cool stuff happens. Okay, look in the top row, second from the right. When I had longer hair, and it was pink... uh. Weird. Cleaver pointed it out to me in the locker room when we got programs actually. Maybe she just looks similar from afar. Let's go visit her. I think that's Rosie the Wrecker. There's a close-up of her on their website. I don't think there's that much of a resemblance, not enough to be your doppelganger anyway. In this photo she doesn't look much like you at all (though she does look very German, so maybe there is a link somewhere).